The 2015 Rugby World Cup is scheduled to be the eighth Rugby World Cup, the quadrennial rugby union world championship. The tournament will be hosted by England[nb 1] from 18 September to 31 October 2015. 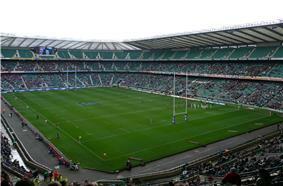 Twickenham Stadium will host the final. England was chosen to host the competition in July 2009, beating rival bids from Italy, Japan and South Africa. Four countries submitted formal bids to host the tournament, with England being recommended by the competition's organisers, Rugby World Cup Limited, to the International Rugby Board (Now known as World Rugby[nb 2]) RWCL chairman Bernard Lapasset revealed the result on 28 July 2009 at IRB headquarters. The International Rugby Board requested that any member unions wishing to host this tournament or the 2019 Rugby World Cup should indicate their interest by 15 August 2008. This would be purely to indicate interest; no details had to be provided at this stage. A record ten unions indicated formal interest in hosting the 2015 and/or the 2019 events: Australia, England, Ireland, Italy, Jamaica, Japan, Russia, Scotland, South Africa and Wales. Argentina had been reported in early 2008 as having given preliminary consideration to bidding, but did not ultimately formally indicate an interest in bidding. Of the 10 nations that had expressed formal interest, many withdrew their candidacy in early 2009. Jamaica was the first to withdraw its candidacy. Russia withdrew in February 2009 to concentrate on bidding for the 2013 Rugby World Cup Sevens, Australia and Ireland withdrew in spring 2009 due to financial reasons. Scotland withdrew in April 2009 after they were unable to secure co-hosting partners for the tournament. Wales was the last nation to officially pull out after they failed to submit a bid by 8 May 2009, but Wales backed England's bid and some games will be played at Cardiff's Millennium Stadium. The final nations that bid for the right to host the 2015 Rugby World Cup were England, Japan, South Africa and Italy. Four confirmed bids was a record number for the Rugby World Cup. On 28 July 2009, the International Rugby Board (IRB) confirmed that England would host the 2015 Rugby World Cup, and Japan would host the 2019 event, having voted 16–10 in favour of approving the recommendation from Rugby World Cup Ltd (RWCL) that England and Japan should be named hosts. In September 2007, The Guardian reported that the Rugby Football Union had decided to submit a bid. BBC News reported in February 2009 that the intent was for a solo bid from the RFU, but with the possibility of some matches being played in Scotland, Wales or Ireland. It was hoped that the 2015 World Cup would add to Britain's "Decade of Sport" (including the 2012 Summer Olympics). It was also claimed that the bid had a very strong chance of success due to the IRB's belief that the 2011 tournament might make a loss, therefore making it particularly important to ensure a profit, which was considered a strong point of England's proposed bid. The chief executive of the Rugby Football Union, Francis Baron, said that the tournament will target sales of 3 million tickets. England's package was projected to generate £300m for the IRB – £220m in commercial returns from broadcasting, sponsorship and merchandising, and the £80m tournament fee. Italy stated its desire to host, and an Italian bid to host the Rugby World Cup in 2015 or 2019 was confirmed on 20 July 2008. Italy declared that it wanted to host "For the Enlargement of the Frontiers of Our Sport". It was a slogan relevant to the then-current landscape of World Cup rugby, given that 2007 was the first time that the Rugby World Cup was hosted primarily by a non-English-speaking country. The Italian bid offered the largest cities and stadiums in the country and promised a fast domestic train system to ensure visitors easy access to the games and between cities. The Italian Rugby Federation (FIR) also included the importance of the history of Italy, the population and the growth of rugby since Italy joined the 6 Nations in 2000 as reasons for hosting a World Cup. Rugby had been growing increasingly popular in Italy in recent years, with improved crowds at both international matches and the domestic National Championship of Excellence competition. The FIR referred to the success of the 2007 Rugby World Cup in France as a key for why it should host. Fans from England, Scotland, Ireland and Wales and other European countries went to matches in France in large numbers, and Italy was therefore predicted to receive a large number of visitors. The Stadio Olimpico in Rome had been proposed as the venue to host the final and the first match of the tournament. Milan and Naples were included as the other large venues. The entire list was a selection of large stadiums spread across the country. Stade Vélodrome in Marseille, France was also included as the tenth proposed venue. The Japan Rugby Football Union officially submitted its tender to the International Rugby Board in May 2009. Japan was seen as a favourite to host after finishing runner-up in the bidding for the 2011 event. Japan was seen as having a lot to offer rugby's growth in Asia. Its population of 127 million, its large economy, and its ability to place rugby before a new Asian audience made it a front-runner for hosting rights. Furthermore, rugby in Japan has a developed a following, and with 126,000 registered players, Japan has more players than some of the Six Nations. Japan's Top League is a showcase for Japanese rugby, and there is excitement about Japan's entry into the RWC. Japan's experience in co-hosting the 2002 FIFA World Cup was seen as a boost, with Japan already possessing the necessary stadiums and infrastructure. The South African Rugby Union (SARU) had confirmed its intent to bid for the 2015 tournament, and in May 2009 South Africa delivered its application to the International Rugby Board. South Africa had previously made an unsuccessful bid to host the 2011 RWC. The strengths of a South African bid would be that it is in the same time zone as Europe, the wealthiest television market from a rugby perspective, that South Africa were the current World Cup holders, that they had successfully hosted the 1995 Rugby World Cup, and that they were in the process of building large new stadiums for the then-upcoming 2010 FIFA World Cup. 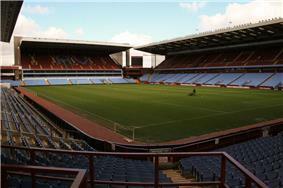 After England were appointed tournament hosts on 28 July 2009, the proposed stadia for the tournament were revealed. The final venues were confirmed, along with the tournament's schedule, on 2 May 2013. 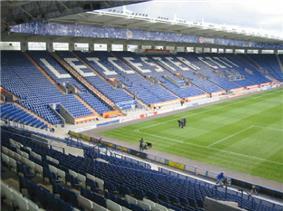 Twelve of the stadia are located in England while the Millennium Stadium is in Wales. In 2011 the IRB approved the use of the Millennium Stadium, despite being outside of the host country, due to its capacity and strategic location. Out of the thirteen venues two are dedicated rugby union grounds (Kingsholm Stadium and Sandy Park); two are national rugby stadiums (Twickenham and the Millennium Stadium); one is multi-purpose (Olympic Stadium) and the remainder are association football grounds. 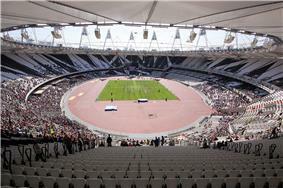 Location of the 13 stadia to host rugby matches at the 2015 IRB World Cup announced on 2 May 2013. The 41 venues that will act as team bases for the competing nations were announced on 26 August 2014. All prospective team bases were subject to a rigorous selection process which included an expansive and detailed programme of site visits as well as liaison with the competing Rugby World Cup 2015 teams. A team base will consist of an outdoor and indoor training facility, a swimming pool, gym and hotel and will be utilised by the competing teams in the lead up to and during the World Cup. As the host nation, England qualify automatically, as do all of the teams that finished in the top three of their pool at the 2011 Rugby World Cup. The qualification process for the remaining teams incorporates existing regional competitions such as the European Nations Cup. A total of 20 teams will play in the final tournament. The below teams are the final 20 teams that will participate (shown with pre-tournament rankings as of 17 November 2014), exactly the same of 2003. The first round, or pool stage, sees the 20 teams divided into four pools of five teams, using the same format that was used in 2003, 2007, and 2011. The pool stage draw was conducted at the Tate Modern on 3 December 2012, and divided the 12 automatic qualifiers into three bands according to their place in the most recent World Ranking. Each pool is a single round-robin of ten games, in which each team plays one match against each of the other teams in the same pool. Teams are awarded four points for a win, two points for a draw and none for a defeat. A team scoring four or more tries in one match will score a bonus point, as will a team that loses by seven points or fewer. The teams finishing in the top two of each pool will advance to the quarter-finals. The top three teams of each pool will receive automatic qualification to the 2019 Rugby World Cup. ITV Sport will be the UK and worldwide host broadcaster for the 2015 event, having signed a deal in 2011 to broadcast the 2011 and 2015 RWC tournaments. 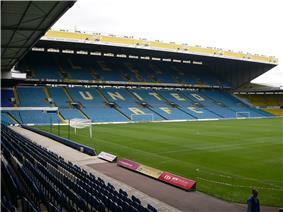 ITV won the rights after outbidding rivals including the BBC and Sky Sports. It will show every match from the tournament live in the UK on ITV and ITV4. Welsh language broadcaster S4C will show all of Wales' pool games (and the opening match), along with one game from each corresponding knockout fixture. In Ireland, TV3 and sister channel 3e will broadcast the matches. 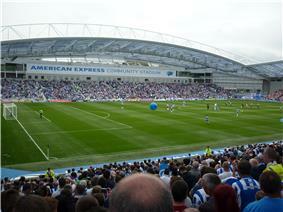 Ticket prices were announced in November 2013 with general sale applications launching in September 2014. Adult ticket prices start at £15 for pool matches and children's tickets will be available from £7 at 41 of the 48 matches. Tickets for the World Cup final range from £150 to £715. The organisers have said to the effect that, 'every effort will be made to prevent ticket touts making improper gains from genuine fans'. Nevertheless, tickets for England games and for the play-offs were on sale within a few days at prices in excess of £250 each with the final at over £1,000. ^ Although England, and its governing body the Rugby Football Union, is officially the sole host nation of the tournament, some matches will be played in Cardiff, Wales. ^ "September 18 start date for RWC 2015". IRB.com. 15 May 2012. Retrieved 15 May 2012. ^ "IRB to change name to World Rugby" (Press release). International Rugby Board. 28 August 2014. Retrieved 28 August 2014. ^ "England set to get 2015 World Cup". 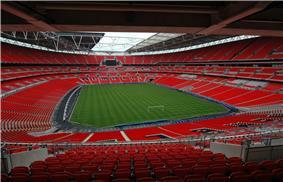 ^ a b c "England will host 2015 World Cup". BBC Sport (British Broadcasting Corporation). 28 July 2009. Retrieved 28 July 2009. ^ "Argentina se postuló para organizar el Mundial 2015". rugbytime.com (RugbyTime.com). 26 February 2008. Retrieved 11 October 2011. ^ "Russia keen to bid for RWC Sevens 2013". IRB.com (International Rugby Board). Retrieved 15 February 2009. ^ "Ireland opt out of 2015 bidding". BBC Sport. 1 May 2009. Archived from the original on 4 May 2009. Retrieved 6 May 2009. ^ "Australia ends 2015 World Cup bid". BBC Sport (British Broadcasting Corporation). 20 April 2009. Archived from the original on 23 April 2009. Retrieved 6 May 2009. ^ "Scotland pull out of RWC 2015 bid". BBC Sport (British Broadcasting Corporation). 29 April 2009. Archived from the original on 30 April 2009. Retrieved 29 April 2009. 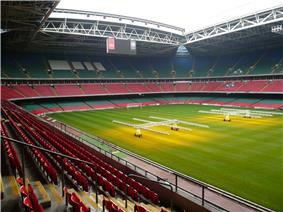 ^ "Millennium Stadium chosen as 2015 Rugby World Cup venue". BBC Sport. 24 May 2011. Retrieved 24 May 2011. ^ "England 2015 will be best Rugby World Cup ever, says RFU chief Francis Baron". Daily Telegraph. 28 July 2009. Retrieved 20 November 2013. ^ "England to make solo 2015 Cup bid". BBC Sport (British Broadcasting Corporation). 19 February 2009. Archived from the original on 22 February 2009. Retrieved 20 February 2009. ^ Rees, Paul (1 September 2007). 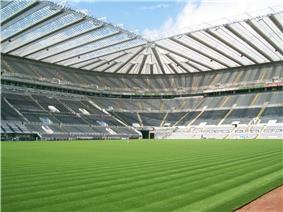 "England can bank on 2015 cup as board pushes for profit". The Guardian (London). Retrieved 23 April 2010. ^ Bates, Rupert (2 September 2007). "Diego Dominguez ready for Rugby World Cup". The Daily Telegraph (London). Retrieved 23 April 2010. ^ "South Africa bids for World Cup". ^ "RWC 2015 venues and schedule announced". rugbyworldcup.com (International Rugby Board). 2 May 2013. Retrieved 2 May 2013. ^ "Millennium Stadium confirmed as RWC'15 venue". ESPN Scrum. 24 May 2011. Retrieved 24 May 2011. 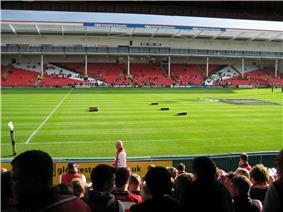 ^ "Rugby World Cup: guide to England 2015 stadiums". ^ "Rugby World Cup 2015 Long list of potential venues". ^ Rumsby, Ben (3 April 2013). 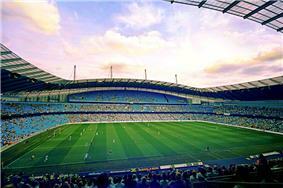 "2015 Rugby World Cup can only persuade Manchester City to host one game". The Telegraph. Retrieved 4 April 2013. ^ "RWC 2015 venues and schedule announced". 2 May 2013. Retrieved 2014-01-17. 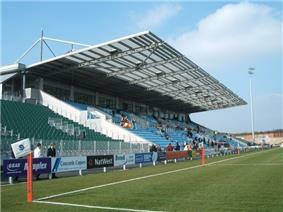 ^ "RWC 2015: Sandy Park". Retrieved 26 June 2013. ^ "Major changes made to RWC qualifying". worldcupweb.com. 10 May 2007. Retrieved 30 June 2009. ^ "Top four settled for RWC 2015 pool draw". rugbyworldcup.com. Retrieved 29 November 2012. ^ "'"Rugby World Cup 2015 draw: England drawn with Wales and Australia in 'Group of death. Daily Telegraph. 3 December 2012. Retrieved 4 December 2012. ^ "Rugby – ITV Sport: 2015 Rugby World Cup draw". itv.com. 27 May 2011. Retrieved 3 December 2012. ^ "England land Wales and Australia in 2015 Rugby World Cup draw". The Guardian. 3 December 2012. Retrieved 4 December 2012. ^ "ITV secures television rights to 2011 and 2015 Rugby Union World Cups". Daily Telegraph. 28 July 2010. Retrieved 4 December 2012. ^ "Rugby World Cup 2015". s4c.co.uk. 2014-07-02. Retrieved 2014-08-22. ^ "2.3m tickets for Rugby World Cup 2015". rugbyworldcup.com (International Rugby Board). 27 November 2013. Retrieved 27 November 2013. ^ "Rugby World Cup 2015: Cheapest Twickenham final ticket is £150". BBC Sport (British Broadcasting Corporation). 27 November 2013. Retrieved 27 November 2013.